In spite of the repeated warnings of those Elves true to the Pact, the Ambrians have violated the borders of Davokar time and again. Their pursuit of treasure and belief in their natural right to anything they can take by force or daring deed threatens a fragile and precarious peace. However, Davokar does not make the agreement easy to uphold. Like the crashing waves of a great green ocean, the borders of the forest extend and contract unpredictably. Sometimes unwary explorers and travellers chance upon ruins and shattered remains, out in the open lands of northern Ambria, unaware they have set foot within the bounds of the great forest at ‘low tide’. Travelling through the grasslands of central Ambria at the close of the day, the character’s spy lights in the windows of a low tower in the near distance. Approaching the tower, the characters find the grasslands pocked with jagged rock, as tall as any of them. A character with a martial background will perceive possible evidence of defences, perhaps the shattered remains of simple towers or guard posts. A Novice Loremaster will recognise the rock as a defence, but with a mystical aspect, possibly still intact. An Adept Loremaster inspecting the rock closely will spy fragmentary Elven characters engraved on the rock; they would appear intended to instil certain protections or wards. Any character moving around inside the tower for long feels an odd sensation like vertigo, especially if they ascend to one of the upper levels seeking out the lights in the windows. The tower stands at a slight angle to the ground as if built askew, and that plays merry havoc with the sense of balance. Any physical activity inside the tower suffers a +1 difficulty. A search through the tower finds the place intact but abandoned. Characters find remnants of furniture, threadbare tapestries, scattered items of a decorative nature (roll 1D4+2 times on the Curiosities table in Adventure Pack 1, doubling the value of any item that you roll more than once). Nothing in the tower suggests recent permanent occupation, though the lower level appears to have been used as a camp by travellers more than once – and they have left scattered remains. The characters can find no evidence of torches or open fires that would explain the lights they saw from a distance. What the characters do find suggest that the tower has been uninhabited for a long time, and the heritage of the occupants remains unclear. A Master Loremaster may identify certain aspects of the craftsmanship have influences from the Symbaroum Empire, but that could just mean the tower belonged to a wealthy collector or a treasure-seeker from centuries past. [Vigilance+2] notes that what at first appears dusty is actually a rime of frost. The characters may also realise that despite the chill of the air outside, the interior of the tower seems colder still. Characters with a gung-ho attitude may fight the Frostlights, but, in truth, the spirits don’t want to engage at all. The drifting cold lights just want to stay well clear of the real foe. A Novice in Beast Lore recognises that the Frostlights act in a way that suggests Flight rather than Fight. The rooms within the tower follow a fairly linear track, such that the Frostlights need to pass the characters on the way toward the rooftop. Characters will also figure out at this point that the lights in the tower windows must have come from one or more of the Frostlights. The Soulless follow in short order, a few turns after the Frostlights. They have a more traditional semblance to the shambling dead, unlike The Sleepless with which many Ambrians will have had contact. Players might feel more at home with these half-blind and moaning monstrosities because they genuinely do want to pursue the characters and consume their flesh. The Soulless fight as Cult Followers, but with the Undead Trait. They wear tattered travelling clothes, the meagre remnants of finery, or nothing at all – revealing their grey, leathery flesh crisscrossed with scars and seeping wounds that bubble with pus. Make the players uncomfortable about the oozing wounds, raising concern about corruption or poison – but, honestly, they’re just disgusting injuries. As Weak foes, you should have one per player PLUS TWO – assuming you have starting characters. Add another Soulless for each additional 50 Experience in the party, or part thereof. If you have a part of 5 adventurers who have played through two adventures and earned 20 Experience each – that totals 350 Experience, so they should face NINE of the Soulless (see Challenge and Resistance for a handy table). 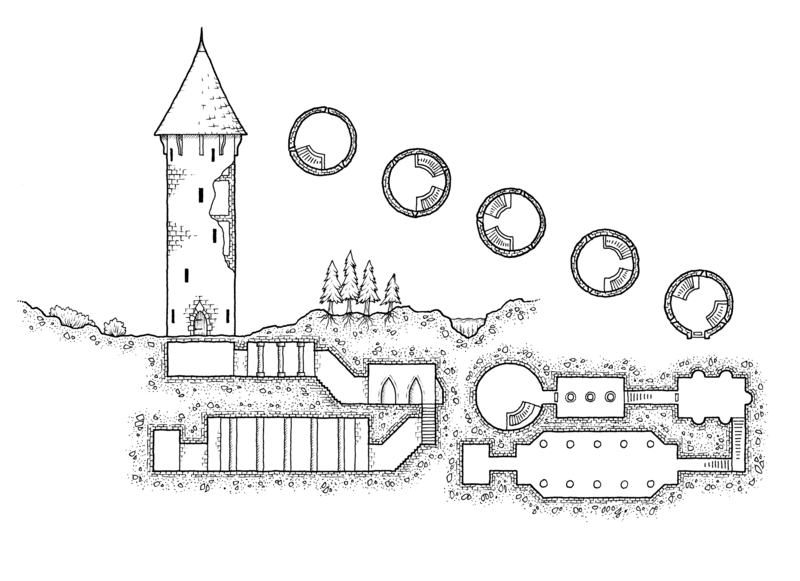 Give the players the opportunity to make use of the features of the tower in describing the way their characters interact with their foe – tables to hide behind or launch off, narrow stone stairs to channel the Soulless along, and so forth. The Soulless are a by-product of the Alternative Damage caused by the Soul Eater. The Soul Eater hails from the depths. This tower that the characters have discovered spends most of the time buried safely beneath the ground, with the warding stones on the surface. Once dungenesis causes the tower to sink again it will return the Soul Eater to that prison beneath the earth – unless the characters fail to do something about it. The characters really don’t want to fight the Soul Eater. Use the statistics of a Cryptwalker, replacing Gravely Cold (III) with Alternative Damage (III, Strong). Also, swap the scores of Persuasive and Discreet. After defeating The Soulless, a grumbling tremor shakes the ground and foul smelling gust sweeps up from a stairway that leads down. A soul shredding scream fills the air, like dozens of people yelling in anguish – which is exactly what they’re hearing. The Soul Eater drains creatures of their essential essence, leaving mindless husks. Anyone venturing down the stairs finds the first chamber scattered with more remains from unwary travellers and sees something like the image on page 232/233 of the core book – a towering shadow with a vaguely human form carrying twin blades. The air swirls with dust, followed by a blast of fetid air. A test of [Strong-4] or any character underground suffers 1D6 damage, overwhelmed by an unsettling wave of weakness like something just tore a little of their soul away. In the ideal outcome, the characters need to find a way to hold the Soulless at bay until the tower sinks beneath the ground again, whether through direct conflict or finding a means to seal it inside. The tower is not the strongest of structures and they might come up with a plan that could cause the whole thing to collapse. With Persuasive skills, the characters might find a way to get the Frostlights to assist them. In this adventure, the Frostlights are not the enemy. Characters should get the feeling that the Soul Eater scares them, too. If the party willing give up 5 points of Strong to the Frostlights, they will distract the Soul Eater. The nature of this bargain should become clear to a character in the party who possesses the training of a magical Tradition or some form of empathic skill. Failing that, choose the character with the highest Persuasive and explain the Frostlights might be a potential ally, at a cost. The jagged rocks around the tower genuinely serve as a means to ward and protect – by keeping the Soul Eater in. However, over the centuries they have become twisted about and the power of that ward has faltered. Turning four of the stones, at the cardinal points of the compass, so that the Elven script face inward will restore sufficient protections to prevent the Soul Eater from escaping. Characters with a combined Strong of 20 or more can turn a single stone. If the players come up with a good idea that provides excitement and challenge, run with it. Anything that involves a bit of sacrifice also wins on a story level – the valiant, but doomed, adventurer fending off the horrible enemy as his companions act on some other plan to bury the threat. If the characters fail, the Soulless will escape into the wider world and many local settlements will become ghosts, empty buildings filled with corpses and the shambling dead. The Queen will despatch Theurgy, soldiers, and Black Cloaks – one of which might just have the wherewithal to put the Soulless down. Many will die in the process. Without more study and research, probably through seeking out forbidden lore in other tombs, a character won’t know whether The Soul Eater represents a creation of the Symbaroum Empire or one of them. It could even be something they summoned from other dimensions altogether. You can narrate the appearance and content of the tower, but sometimes a map helps! You can find a lot of budding map creators online with a quick search through online communities or a search engine. For example, the Wardcroft Tower, below, could work if the players ever come back and go after the Soul Eater in the ‘crypts’ beneath – though I’d suggest the chambers go deeper still.